Aono (Blue Fields) East/West is from a series of drawings based on my family name, Aono, which can translate from Japanese as Blue Fields. These relate to the migration of my grandparents from the rice paddies of Japan, across the oceans to the United States of America, and through the generations, to the Great Lakes of the Midwest. 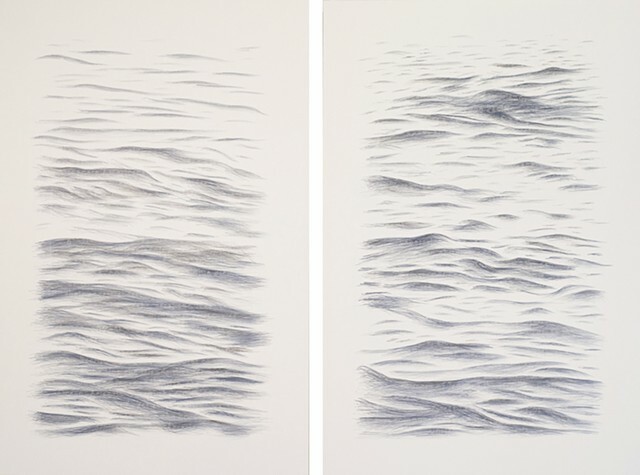 These drawings contain hand-inscribed text, written by me describing my familys immigration and the bodies of water they have traveled to arrive in their new home. This series uses my process of holding drawing utensils like Hashi (chopsticks), as a conceptual means to express the duality of embracing our cultural differences and similarities. With two pencils in my hand, I manipulate them to work in opposition to each other in order to create the drawing.